According to ChemOrbis, PS players are wrapping up their January business with monthly decreases of €200-230/ton after sellers issued additional price decreases on top of their initial reductions. Expectations for February are calling for refreshed price declines based on lower expected styrene contracts. Nonetheless, many players opine that the market will be nearing the bottom level afterwards pointing to recently firming spot styrene monomer costs. 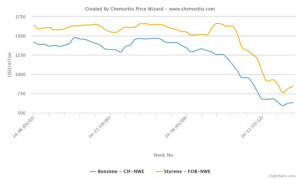 Expectations for the awaited styrene contracts centered on decreases ranging between €20-70/ton before new ethylene contracts settled down €70/ton later this week. Spot styrene prices were reported almost steady at $860/ton FOB NWE on the week. They still stand $75/ton below early January levels though. 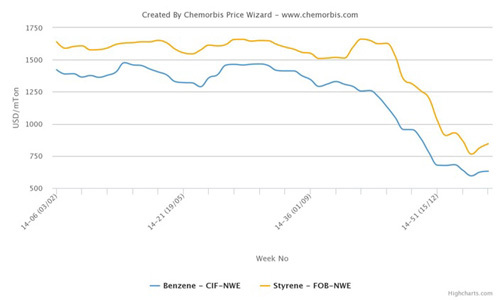 Benzene costs indicated a $25/ton loss on the week at $575/ton CIF NWE and a decrease of around $100/ton from early January. Several sellers reported that they were pretty much satisfied with demand this past month while buyers said they kept their purchases to a bare minimum given their anticipations of additional discounts in February. Availability was said to be generally sufficient, although a few sellers commented that GPPS supplies had tightened in the second part of the month. Another converter purchased on a needs basis as his end product demand is weak. “We expect the downward trend to continue in February even if producers will try to contain the decreases to preserve their margins. PS prices are nearing the bottom,” he said. “We forecast further slight decreases to pass on styrene monomer contracts for February, however the downward trend is about to slow down and prices may see a certain stabilization in the forthcoming months,” a buyer also agreed. In Germany, a distributor offering West European PS cargos noted that he expects to see drops between €20-80/ton for the approaching month as per ChemOrbis. A packaging converter thinks that prices may even see some slight downward revisions in March considering the gap between feedstock and monomers costs. “However, we expect stabilization on PS prices in the months ahead. Meanwhile, West European producers will focus mainly on Europe in February despite the supportive euro/dollar parity as demand outside Europe is low also for the Chinese New Year,” he commented. Will rising export availability from China undermine bullish PVC sentiment in Asia?